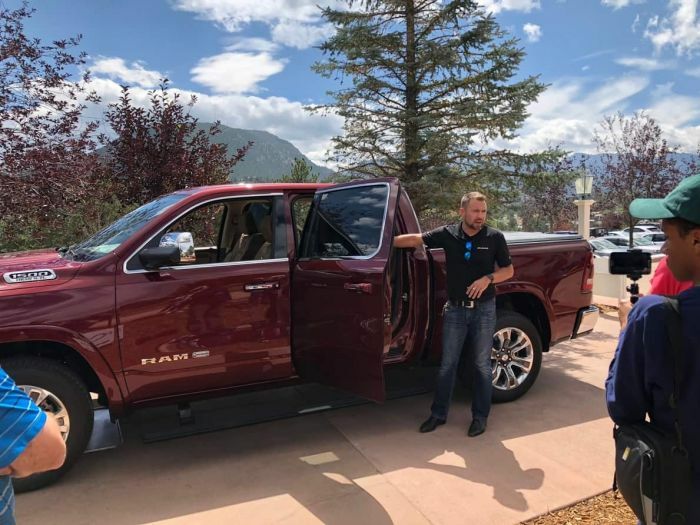 The 2019 Ram 1500 Laramie Longhorn sets a new benchmark for pickup truck luxury and Ryan Nagode couldn’t be prouder. Nagode is the Chief Interior Designer for Ram and SRT at Fiat Chrysler. Nagode accompanied the 2019 Ram 1500 Laramie Longhorn during the recent Rocky Mountain Automotive Press event. As we were driving through the Rockies, Nagode told me about the special design touches in the 2019 Ram 1500 Longhorn. Nagode has a BFA in Industrial Design from the Cleveland Institute of Art, and he thought he would go into toy design like his father. Instead, he designs big vehicles for big kids and he wants to make sure that there is an interior to suit every driver and what every driver wants in a vehicle. Nagode is quick to point out that there are six different trim levels. He says it is the biggest span of offerings available for any pickup. The different trim levels and price points mean that vehicle buyers can select the truck that works best for them. Nagode describes the Ram 1500 Longhorn I was driving as a “brutiful” truck, both luxurious and powerful with the 5.7L Hemi V-8. I asked Nagode what reflects his leadership in the interior design, and he pointed out the antique-looking wood finishes and the higher grades of leather used in the seats. He said that he wants owners to get the feeling that the truck was built especially for them. During his presentation he stressed that the 2019 Ram Longhorn has the highest percentage of leather of any pickup on the market. Nagode says the designers know that trucks receive a lot of wear and tear and he says these trucks are designed to take it and look even better with age. The 2019 Ram 1500s are lighter, longer and wider, which means that there is more room in the interior. The extra room means that they could put in reclining seats for the rear seat passengers, a perk that could really come in handy if you routinely have people riding with you. The 2019s are 225 pounds lighter than previous models which also helps with fuel economy. The 2019 Ram 1500 has the first 12” infotainment touchscreen and Nagode says that it was extremely important to the designers that the screen be functional but not too distracting. They wanted to make sure that the controls were easy to use and didn’t draw the driver’s eyes away from the road for too long. The 2019 Ram Laramie Longhorn has the Ram exclusive in-floor storage bins. The in-floor storage has been a big selling point for many pickup buyers. They are popular when you have items like tools that you want to secure. The Ram 1500 Longhorn also has a center console in the front seat that can be configured a dozen different ways, helping the driver stay organized whether they want to be or not. These are just some of the reasons that the 2019 Ram 1500 won an award from Wards Automotive for Best Interior. In the latest battle in the pickup truck wars, the 2019 Ram 1500 Longhorn puts the L in luxury!